When Andrea asked me to do a guest post for her while she was on vacation, I was very honoured but truthfully very nervous. I hope that you will all like what I decide to make for you. I will start out with introducing myself. My name is Marlys Folly and I am a Canadian transplant into the United States, I have been living here for 12 years. I grew up in a small town just south of Saskatoon. Six years ago I met the man I was going to marry in Togo, West Africa. While traveling back and forth to Togo to see my husband and also after he finely got his visa to move here, I was intrigued with learning to cook African food. I love their food, it has a lot of flavor and it is full of spices. I am lucky enough to have my husband’s family send me spices from there to get some authenticity into my cooking. After cooking for awhile I decided to compile some of the recipes and that is how my blog started. My only problem is that we eat a lot of the same types of food so I had to branch out and that is why my blog is called “This and That”. As Baking in Saskatoon is more desserts and sweets, I thought I would post something that would go with that theme and I also wanted to do something African. The biggest problem I didn’t have any African foods that are desserts and there aren’t a lot anywhere but I did come across a couple for different types of doughnuts and I love doughnuts so that is what I decided to write about…. An African Doughnut called Sweet Buns. This recipe is from Ghana, a country that I have been to a few times. I used my dough hook on my Mixmaster to do all the work, although I am sure that in Ghana everything is done by hand. In bowl add first 6 ingredients and mix together, add water and mix again. Gradually add flour until dough is sticky. (I used just a little less than 4 cups). 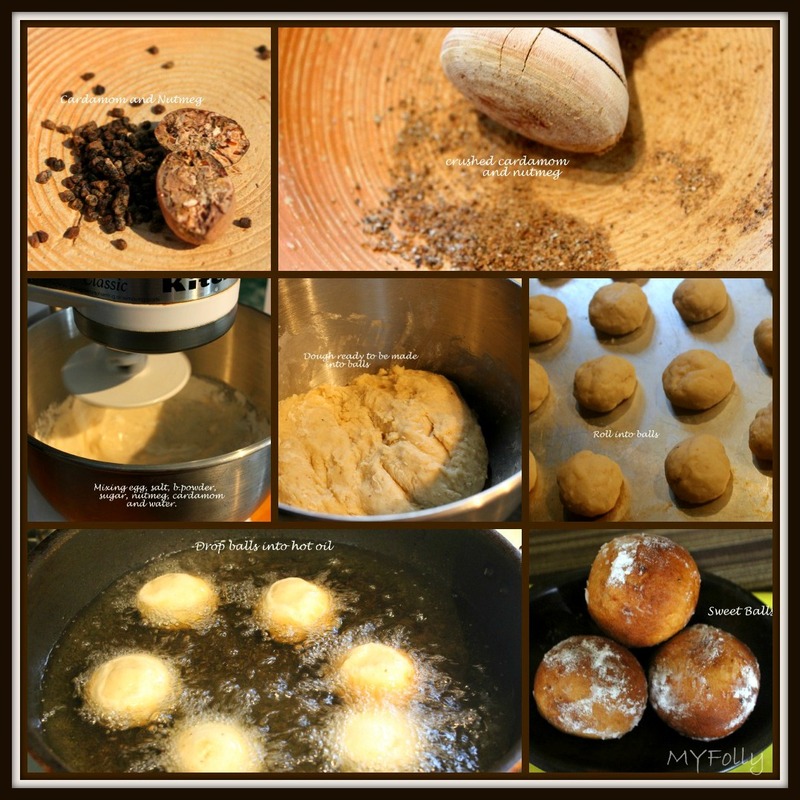 Roll dough in small balls* (about a walnut size). Pour vegetable oil into deep pot ~ enough to just about cover the balls. Heat oil on medium high until hot but not boiling**. Drop a few balls into hot oil and fry for about 3-4 minutes until a golden brown ~ you will need to turn them once the bottoms are a golden brown. Place on paper towel to drain the extra oil. Sprinkle with powdered sugar and eat warm. I did bake a few in the oven. Preheat oven to 350 degrees. Place baking mat on cookie sheet or grease cookie sheet. Roll balls and place on cookie sheet. Bake at 350 degrees for about 30 minutes, until bottoms are brown. The baked cookies are very crispy on the outside and soft in the inside. ** to figure out if the oil is hot enough, place one dough ball in oil and watch to see if oil is bubbling around it. Just a note of interest, the dish that the doughnuts are in and the yellow batic napkin are both from Ghana which I purchased on one of my trips there. Thank you Andrea, for letting me guest post and I hope you are having a great vacation. I love trying recipes from different countries and I will definitely give that one a go! Thanks for posting and great pictures by the way! ! Thanks for letting me guest post Andrea.. Was fun to do it. Am so gonna be trying it soon….. Thanks for the post! Came across via Google. Making this for my sons (who’s 1/2 Ghanaian) school multi-cultural fair in Ontario. And I loved the photos that you included. Side note, in Ghana these are also called “Bofrot Balls”. Cheers! Thank so much for ur wonderful idea on how to bake Ghana buns,because i have been longing to know how to prepare it,since i tested it in Nigeria,it was really delicious. Thank u.i want to start making it can u please explain how to make it in a flat shape. please head over to This & That to speak to Marlys about the recipe. She is the one who shared it on my blog and thus would be able to help you with it.